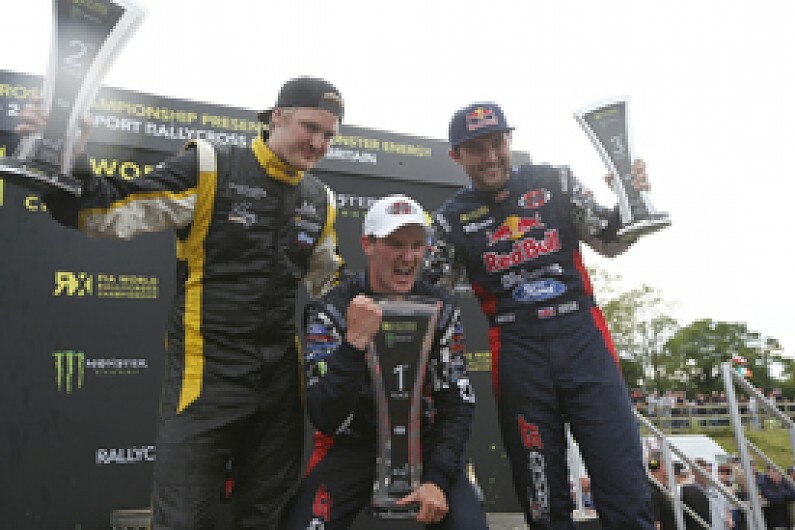 Andreas Bakkerud swept to victory in the second round of the World Rallycross Championship, the AUTOSPORT World RX of Great Britain at Lydden Hill. The Norwegian had topped the order at the end of day one, qualified first at the Intermediate Classification and then won a final in which British Touring Car champion Andrew Jordan starred on his rallycross return. Bakkerud started on the outside of the front row, alongside Toomas Heikkinen, but it was second row starter Robin Larsson who made the best start to lead after the first corner, ahead of Heikkinen and Petter Solberg. Behind them, Bakkerud led Jordan and Tanner Foust into the joker lap. Solberg took his joker lap on the second tour, returning to the main circuit just behind Foust. As the pair entered the next corner, Solberg made a move up the inside of the American only to make contact with the VW Polo and spin into the gravel. Jordan followed Heikkinen before making a move past the Finn at the hairpin on lap three to take third. Bakkerud, running in clear air after his early joker, caught Heikkinen and replicated Jordan's move on the VW man into the hairpin on lap five. Leader Larsson left his joker until the final lap, coming out side-by-side with Bakkerud but unable to regain the lead, settling for an impressive second on his international Supercar debut. Jordan finished third with Heikkinen fourth and Foust fifth. Solberg recovered to finish sixth. "We might not have been fastest all weekend, but we controlled what we were doing and managed the car and tyres, we were the only car with brand new tyres in the final," said Bakkerud. "I grew up in these rallycross paddocks so to win only the second round of the world championship is amazing." Renis Nitiss almost made it three OlsbergsMSE Ford Fiestas in the final but for an electrical problem after winning his semi. The Latvian's non-start promoted Foust into the final. Andy Scott put problems in Portugal behind him to finish his semi final in fifth position. Team Peugeot-Hansen had a poor day, both Peugeot 208s of Timur Timerzyanov and Timmy Hansen retiring with engine problems.